Hello. 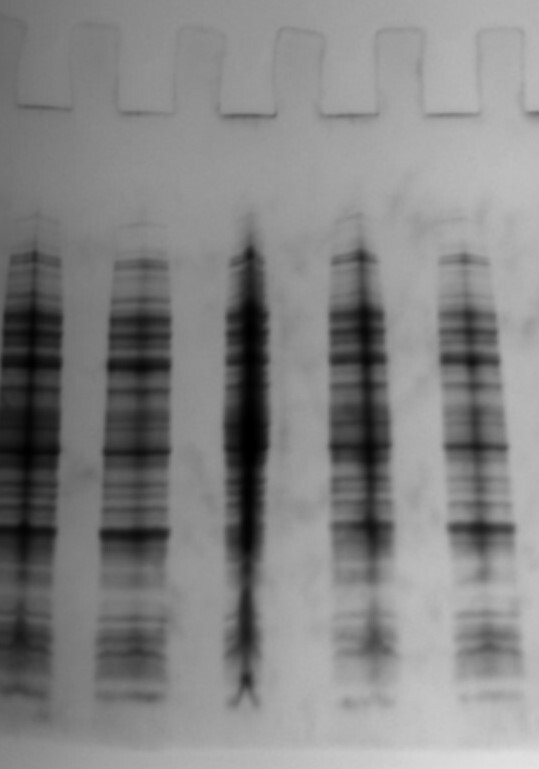 I'm running total cell protein samples in a 4-20% Mini-Protean TGX gels. The center of each lane/sample contains a vertical streak/line. Is this from interference of genomic DNA? I was able to decrease the amount of genomic DNA in my samples (so they had no issues when using a pipettte), which decreased the intensity of the line but did not remove it. It is not a huge issue for me but one I would like to understand better and thought someone on this forum would likely know the answer. It looks DNA to me. you might need to play around your lysis buffer detergent concentration inorder to keep them mild. or if you need the nuclear proteins also use nuclease like Benzonase to eliminate the DNA completely. How to add prepare protein sample for loading into the gel? Heating to denature and reduce protein: same temperature?